What does it mean to reason in AI? Figure: Raven's Progressive Matrices is a test used as a measure of fluid intelligence which includes inductive and deductive reasoning. The problem requires you to replace Aristotle with a figure that satisfies the progression of patterns in both vertical and horizontal directions. These are one of the many kinds of reasoning problems that today's Visual Question Answering AI models might struggle to solve. By end of the first VQA challenge, most researchers agreed that the reasoning capabilities of the first generation VQA models were fairly limited or non-existent. Now a new wave of models are flooding the market which attempt to address this issue. Learning to Reason, Inferring and Executing Programs for Visual Reasoning, and Relation Networks are few examples of these next generation models. In many of these papers, authors do not explicitly define reasoning since what they intend to convey is often clear from context and the examples in the papers. 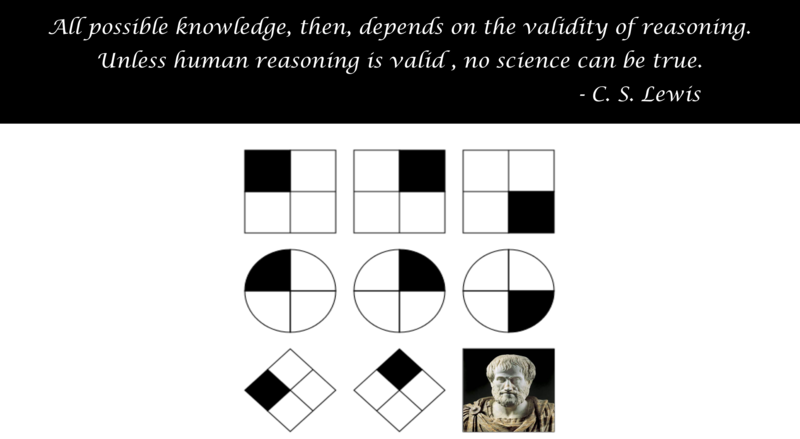 However reasoning is a farily complex concept with many flavors and interesting connections to psychology, logic, and pattern recognition. This warrants a more thorough discussion about what it means to reason in the realm of AI and that’s what this post is all about. What does it mean to reason in layman’s terms? A reason is any justification intended to convince fellow human beings of the correctness of our actions or decisions. In other words, if the sequence of steps or arguments you used to reach a certain conclusion were shown to other people and they reached the same conclusion without questioning any of the arguments, then your reasons have held their ground. Note that what counts as a valid reason is often context-dependent. For instance, consider justifying calling a person crazy. When used in social context, say during an argument with a friend, divergence from commonly expected behaviour or established norms of morality is a valid reason. But these arguments without a clinical diagnosis do not hold any merit in the courthouse of clinical psychology. When would we call an AI agent to be capable of reasoning? Would we still call the agent capable of reasoning if inference consists of only a single step of pattern matching or look up in a database? given the definition of matching criterion, and a correct match a human makes the same prediction. Figure: A simple reasoning QA system. Many would not regard this as a reasoning system, but the algorithm tells us exactly why the system made a particular prediction in a human understandable and verifiable way. Hence the system has provided its reasons which would be perfectly acceptable assuming the database consists of correct QA pairs. What this implies is that a QA system (as shown above) which only expects one of questions, and answers them by matching the question string to a database of question strings paired with their correct answer string, could be called a reasoning system. This is because the system tells you exactly how it computed the answer in a way that can be manually verified (does the retrieved question string match the query question string) and executed to get the same answer. However, if we expand the domain of discourse to include a question that is not stored in the database, the system fails to produce an answer. Therefore, it is a brittle system which is pretty much useless for the domains of discourse that humans usually deal with or would like AI to deal with. It is easy to build a system that reasons, just not one that works for a meaningfully large domain of discourse. Taking the table lookup approach to its extreme, any reasoning problem can be solved by a table lookup provided you could construct a python dictionary with keys as every possible query expected with their values being the corresponding outputs. There is a practical problem though (you think so Sherlock!). This dictionary in most AI applications would be gigantic if not infinitely large. Consider VQA for example. We would need to map every possible image in the world and every possible question that can be asked about it to an answer. People will definitely call you crazy for trying to pull off something like this. But this is where statistical pattern recognition and compositional nature of the queries comes to our rescue by helping us reduce the dictionary size. Mary and John have been married for 5 years. Mary gave birth to a child an year after their marriage. How old is the child now? How old is Mary and John's child now if Mary gave birth to the child the year after they got married? They got married 5 years ago. are semantically the same question but the strings are quite different. For most questions there are plenty of such semantic duplicates. One way to reduce the size of the dictionary is to store only one representative for each unique semantic sense and use statistical pattern recognition (SPR) for learning a semantic matcher instead of a simple string matcher. A naive way is encoding sentences using an RNN trained as a language model and using nearest neighbor lookups in the embedding space. But generally this won’t work nearly as well as we’d hope. This is where smart ways of encoding the sentence using parsing helps. Composition may be though of as another aid to SPR. In the previous example, we can replace the names Mary and John with any other names but the meaning of the question relative to those names and its answer doesn’t change. So the real challenge is to match the following structure which is composed of different types of nodes and edges. These elements combined together represent a unique semantic sense. Figure: Harnessing compositional structure for reasoning. While a question may be asked in many ways, each question with the same meaning can be mapped to a structure comprised of primitive elements. The same primitive elements may be found in questions with a different sense but combined with a different set of primitives. As long as a reasoner understands the meaning of each primitive, the meaning of any syntactically correct novel composition can be derived. execute the formula on the instantiation provided by the query to get the answer. Implementation of VQA systems based on some of the above ideas can be found in Learning to Reason and Inferring and Executing Programs for Visual Reasoning. Both works construct agents which given a question about an image list a sequence of steps, or a program if you will, that can be executed on an image to get the answer. Each consists of passing the image or a feature map through a neural module whose output is a feature map, an attention map, or an answer. Each neural module is dedicated to a certain task such as finding a particular object or attribute, counting, comparison etc. Once assembled the modules form a network that can be trained using backpropagation. This also leads to very efficient data usage for learning through module reuse across different questions. Figure: Inferring and Executing Programs for Visual Reasoning. An RNN predicts a sequence of neural modules which is then converted to a directed binary tree using pre-order traversal. This DAG defines a neural architecture than is executed on an image to predict the answer. The input and output of each neural module are B x H x W dimensional feature maps which conveniently allows bypassing the difficulty of ensuring compatibility of output and input of consecutive modules. Limitations: While these models seem quite powerful and general enough for a large class of questions, they are not perfect. One issues is that these models need to relearn any math or logical operation from scratch while there is really no need to learn things like greater_than using a neural network when most programming languages provide > operator. Some of the operations that the modules try to learn in a weakly supervised way, such as detection and segmentation, have completely supervised datasets and fairly sophisticated models dedicated to these tasks alone. The VQA Machine: Learning How to Use Existing Vision Algorithms to Answer New Questions is a recent paper that uses object, attribute and relationship predictions from specialized and separately trained models as facts in VQA inference. Figure: The VQA Machine: Learning How to Use Existing Vision Algorithms to Answer New Questions. Visual relationship predictions from a model trained specifically for this task are used as facts while answering visual questions. The co-attention framework of Lu et. al is extended to attention over question words/phrases, image regions and facts. A by-product of attention over facts is getting interpretable reasons for VQA inference. Another limitation of these models is that they need the agent that predicts the program to be jump started using some kind of imitation learning using ground truth programs during training which more often than not are hard to come by. Albeit once pretrained, the agents can be finetuned without ground truth programs using REINFORCE. Again these are reasoning models because humans can execute the program in our brains once we see an image and get the answer to the question. An important thing to remember here is that a model doesn’t necessarily have to be dynamic to be doing compositional reasoning. Sometimes the explanation we seek in a reasoning model is not instance specific or even explicit but rather baked into a static architecture. For example, Relation Networks are supposed to be doing relational reasoning but the model does not really provide any instance specific explanation for the predictions. 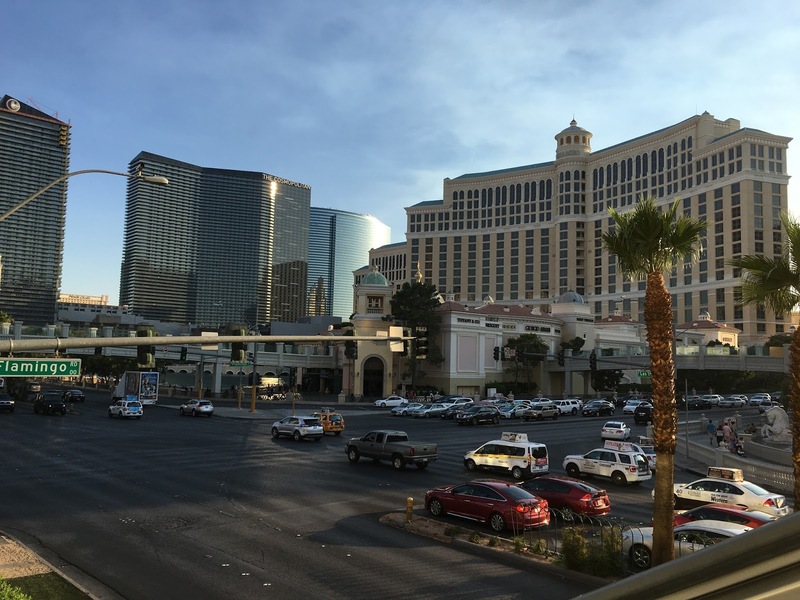 However, the architecture is designed to do more than just single-shot, black-box whole image feature extraction and prediction. Instead the model looks at all possible pairs of regions, encodes each region-pair and question tuple using a shared module, pools these representations using element-wise sum, and finally makes an answer prediction using this image representation. Here the explanation for each prediction (and the reason why we would trust the prediction) is that for answering questions about relations of two objects, we would expect to get the right answer only by looking at pairs of objects, and that is built into this particular model’s inference but is not enforced in the first generation VQA models which perform abysmally on relational questions. with corresponding colors denoting $(A \land$$(A\rightarrow B)$$)$. This means that if we have probabilistic truth values of $A$ and $B$, we can plug it into the above equation and get a value between $[0,1]$ with $1$ indicating the rule being exactly satisfied and $0$ indicating the rule not being satisfied at all. Note that each branch of logic - propositional logic, predicate logic etc. provides a bunch of these general rules of inference. But depending on the problem, one may be able to come up with specific logical rules. For example, an object detector might find it useful to know that cats don’t fall from the sky (usually). 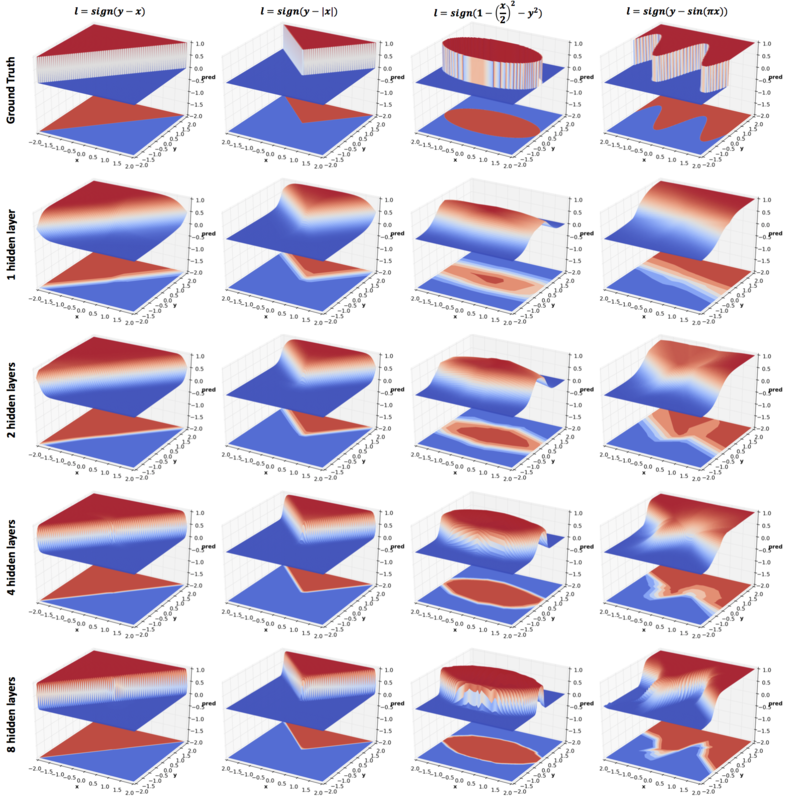 Figure: Harnessing Deep Neural Networks with Logic Rules. The model consists of a teacher and a student network. The student network is any neural network classification model. The teacher network is the same as the student network but with an extra layer that modifies the predictions by projecting it into a rule constrained space. The student network tries to predict the true class while trying to match the output of the teacher network which comply with the provided rules. Note that the teacher network can be trained on unlabelled data as well as long as one knows the rules that need to be applied for each example. What has reasoning got to do with intelligence in humans? The mental ability to learn from experiences, solve problems, and use knowledge to adapt to new situations. While there seems to be some concensus about its definition, the debate about whether there is one core general intelligence or multiple intelligences seems to be still on. The following short video provides a comprehensive overview of 4 major theories of intelligence in psychology and the ongoing debate. For the impatient reader who did not watch the video, below I have summarized, the different factors associated with each theory of intelligence. Notice that reasoning appears in some form or the other in each theory. And just from personal experience, most people would agree that intelligent people do effectively apply the knowledge and skills they have already acquired to solve novel problems. But in order to do so they need to be able to decompose any previously solved problem into a sequence of clearly defined and easily executable inference steps. This allows them to recognize previously seen inference steps (or primitive operations) in novel compositional problem structures. And then it is only a matter of executing those inference steps correctly. Hence in some ways reasoning allows for our finite knowledge to be applicable to much larger set of problems than those we have already seen. 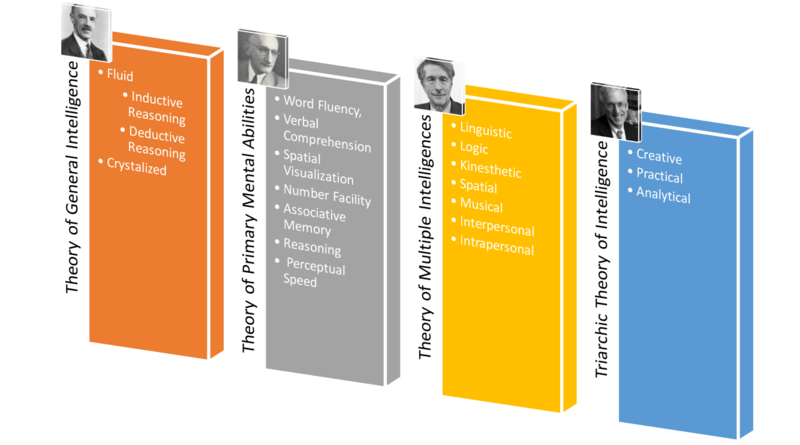 Figure: Major Theories of Intelligence in Psychology. Reasoning is a component of all 4 major theories of intelligence. Hence it is probably safe to assume it plays an important role in human or artificial intelligence. The photographs are those of the psychologists who proposed these theories. In this post our thread of thought began at a layman’s definition of reasoning. We used the layman’s definition to understand reasoning in context of artificial intelligence. There we argued that any reasoning problem can be solved by lookup in a table containing all knowledge man had, has, or will ever seek to have. We acknowledged the practical ridiculousness of this idea and described how math, logic, compositionality, and pattern recognition make the problem more tractable (allowing us to answer more questions from smaller databases). We briefly looked at existing systems that implement some of these ideas. Finally just to mess with your mind, we dabbled in psychology trying to figure out what does reasoning have to do with intelligence in humans. It was a long and winding path. For some of you it might have been a dive into a completely nonsensical rabbit hole. For others it might serve to provide some perspective. Irrespective, feel free to send me an email if you feel strongly about any idea we discussed here, inaccuracies, comments, or suggestions. Hu, Ronghang, et al. 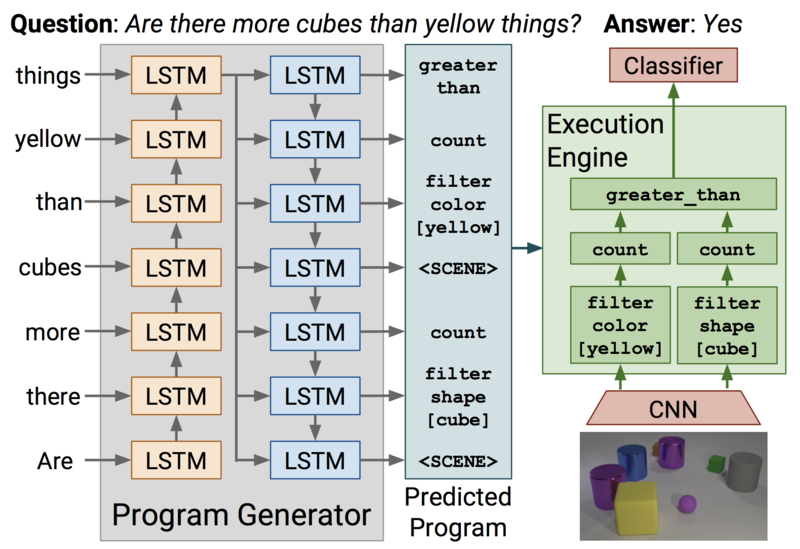 "Learning to reason: End-to-end module networks for visual question answering." arXiv preprint arXiv:1704.05526 (2017). Johnson, Justin, et al. "Inferring and Executing Programs for Visual Reasoning." arXiv preprint arXiv:1705.03633 (2017). Santoro, Adam, et al. "A simple neural network module for relational reasoning." arXiv preprint arXiv:1706.01427 (2017). Wang, Peng, et al. "The VQA-Machine: Learning How to Use Existing Vision Algorithms to Answer New Questions." arXiv preprint arXiv:1612.05386 (2016). Hu, Zhiting, et al. "Harnessing deep neural networks with logic rules." arXiv preprint arXiv:1603.06318 (2016). What 2D data reveals about deep nets? Neural networks (NN) have seen unparalleled success in a wide range of applications. 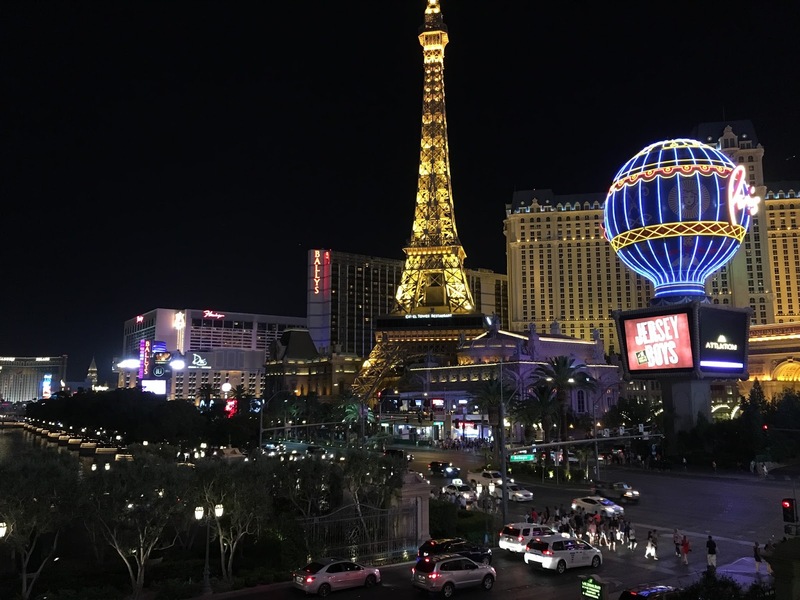 They have ushered in a revolution of sorts in some industries such as transportation and grocery shopping by facilitating technologies like self-driving cars and just-walk-out stores. This has partly been made possible by a deluge of mostly empirically verified tweaks to NN architectures that have made training neural networks easier and sample efficient. The approach used for empirical verification has unanimously been to take a task and dataset, for instance CIFAR for visual classification in the vision community, apply the proposed architecture to the problem, and report the final accuracy. This final number while validating the merit of the proposed approach, reveals only part of the story. 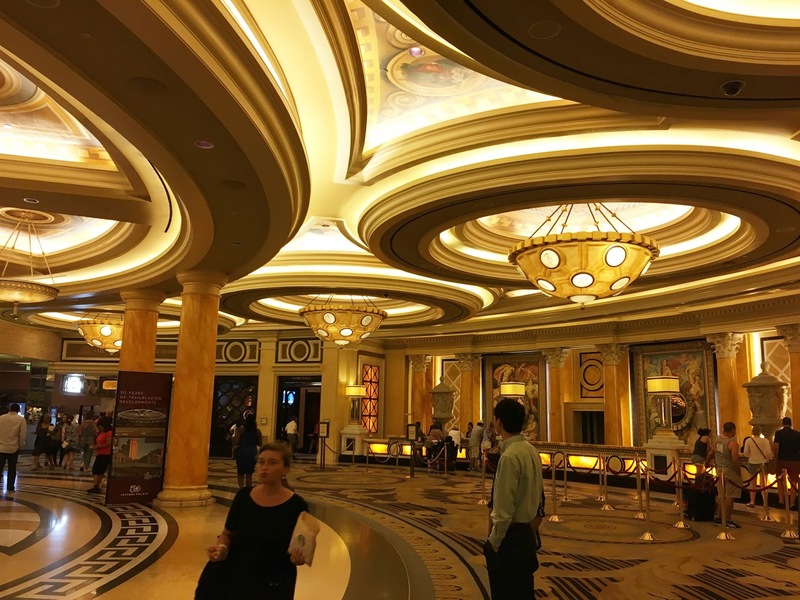 This post attempts to add to that story by asking the following question - what effect do different architectural choices have on the prediction surface of a neural network? 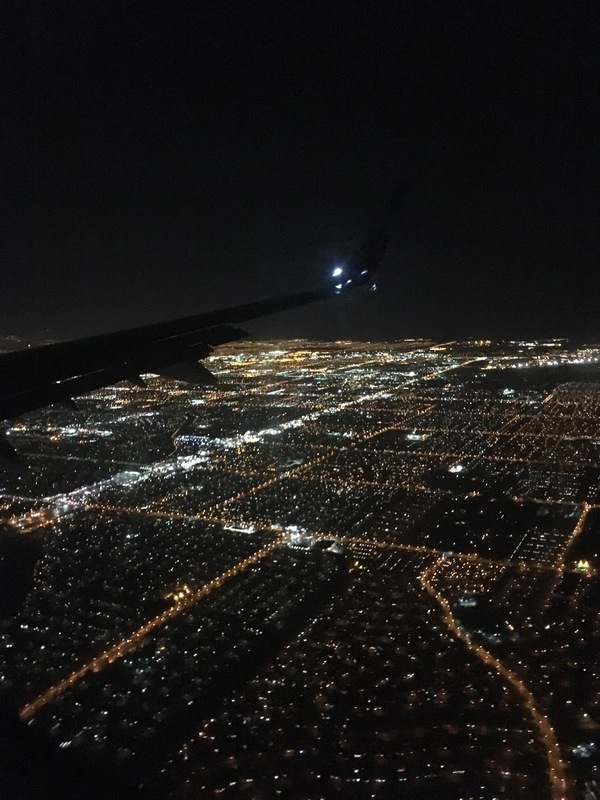 How is this blog different from other efforts to visually understand neural networks? Complexity and Dimensionality of Datasets: Most works try to understand what the network has learned on large, complex, high dimensional datasets like ImageNet, CIFAR or MNIST. In contrast this post only deals with 2D data with mathematically well defined decision boundaries. 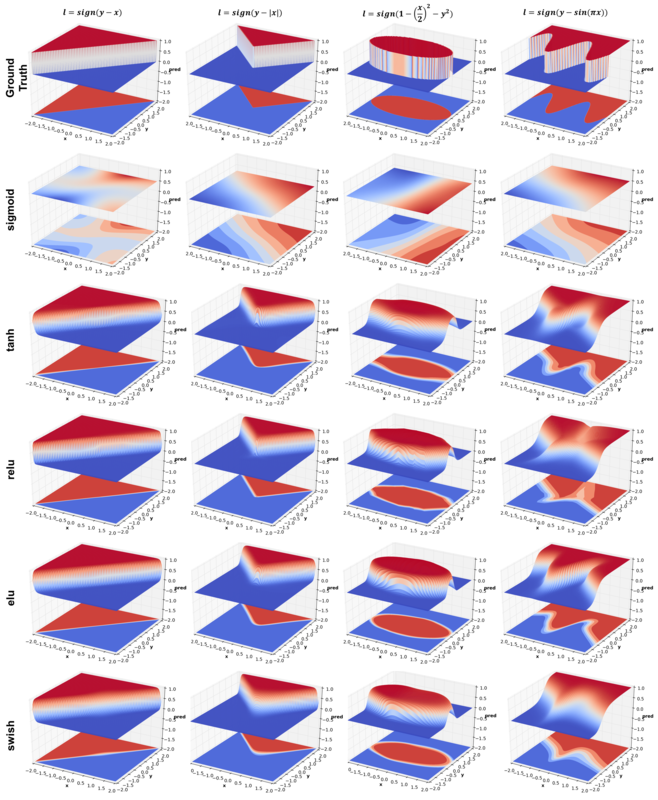 Visualizing the learned decision function vs visualizing indirect measures of it: Due to the above mentioned issues of dimensionality and size of the datasets, researchers are forced to visualize features, activations or filters (see this tutorial for an overview). However, these visualizations are an indirect measure of the functional mapping from input to output that the network represents. This post takes the most direct route - take simple 2D data and well defined decision boundaries, and directly visualize the prediction surface. The code used for this post is available on Github. 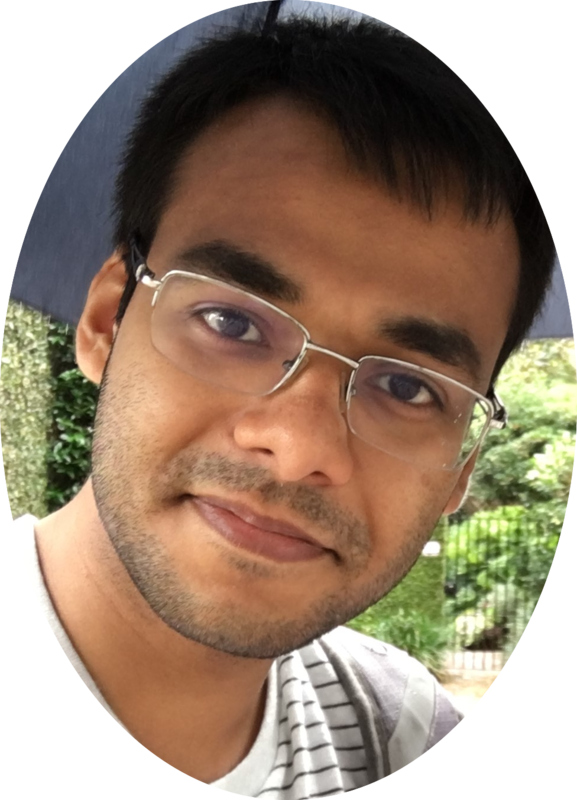 Its written in Python using Tensorflow and NumPy. One of the purposes of this post is to provide the readers with an easy to use code base that is easily extensible and allows further experimentation along this direction. Whenever you come across a new paper on arXiv proposing a new activation function or initialization or whatever, try it out quickly and see results within minutes. The code can easily be run on a laptop without GPU. a softmax layer to convert logits to probability of each label . Training: The parameters are learned by minimizing a binary cross entropy loss using SGD. Unless specified otherwise, assume training samples, a mini-batch size of , and epochs. All experiments use a learning rate of . Xavier initialization is used to initialize weights in all layers. Each experiment will try to vary as few factors as possible while keeping others fixed. Unless specified otherwise, the architecture consists of 4 hidden layers with 10 units each and relu activation. No dropout or batch normalization is used in this barebones model. Sigmoid performs poorly. This is because of its large saturation regions which yield very small gradients. It is possible that results could be improved by using a higher learning rate. Given that sigmoid fails miserably, its surprising that tanh works so well since it has a shape similar to sigmoid but shifted to lie between instead of . In fact tanh works better than relu in this case. It might simply be because it receives larger gradients than sigmoid or relu because of larger slope (~ ) around . The elu paper also points to some references that provide theoretical justification for using centered activations. Many people don’t realize that NN with relus, no matter how deep, produce a piecewise linear prediction surface. This can be clearly observed in jagged contour plots of ellipse and sine functions. It is also interesting to compare elu and relu. While relus turn negative input to 0, elus instead use . See the original elu paper for theoretical justification of this phenomenon. Update Oct 19 2017 - The figure above has been updated with swish, a new activation function which is a weird mix of relu and sigmoid and is defined as . Qualitatively the results look similar to relu but smoother. Checkout the paper for more details. As mentioned in the previous section, relus produce piecewise linear functions. From the figure above we observe that the approximation becomes increasingly accurate with higher confidence predictions and crisper decision boundaries as the depth increases. As with depth, increasing the width improves performance. However, comparing Very Wide Uniform with 8 hidden layers network of the previous section (same width as the Medium Uniform network), increasing depth seems to be a significantly more efficient use of parameters (~5k vs ~1k). This result is theoretically proved in the paper Benefits of depth in neural networks. One might want to reduce the parameters in Very Wide Uniform by reducing width with depth (layers closer to output are narrower). The effect of this can be seen in Decreasing. The effect of reversing the order can be seen in Increasing. I have also included results for an Hour Glass architecture whose width first decreases and then increases. More experiments are needed to comment on the effect of the last three configurations. Dropout was introduced as a means to regularize neural networks and so it does in the above results. The amount of regularization is inversely related to the keep probability. Comparing the last row with 4 hidden layers network in the Effect of Depth section, we see quite significant regularization effect even with a high keep probability. But this comparison is not entirely fair since there is no noise in the data. 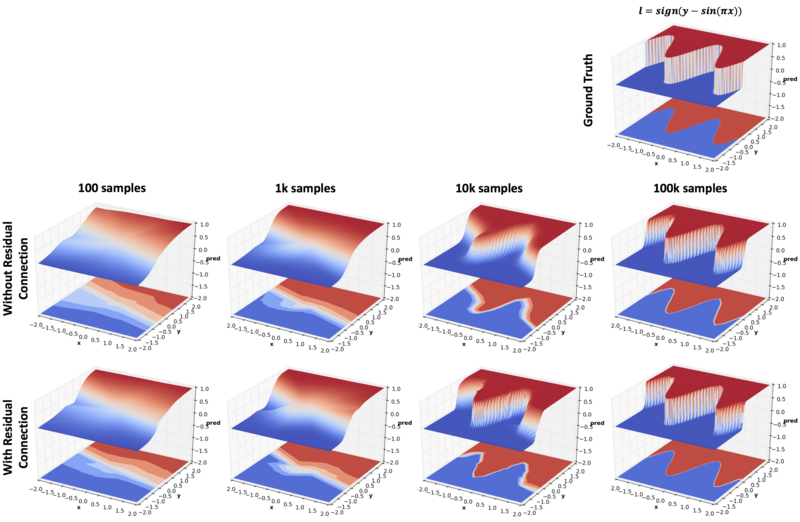 Batch normalization is reported to speed up training by a factor of 13 for ImageNet classification tasks. The above figure shows the benefit gained by using batch normalization. You will find that this model with batch normalization beats the 8 hidden layer network without batch normalization in the Effect of Depth section. You can also compare it to elu in Effect of Activations section. elu was proposed as a cheaper alternative to Batch normalization, and indeed they compare well. The above figure compares networks with and without residual connections trained on different number of training examples. Whenever the input and output size of a layer matches. the residual connection adds the input back to the output before applying the activation and passing on the result to the next layer. Recall that the residual block used in the original ResNet paper used 2 convolutional layers with relus in between. Here a residual block consists of a single fully connected layer and no relu activation. Even then, residual connections noticeably improve performance. The other purpose of this experiment was to see how the prediction surface changes with the number of training samples available. Mini-batch size of 100 was used for this experiment since the smallest training set size used is 100. Neural networks are complicated. But so are high dimensional datasets that are used to understand them. Naturally, trying to understand what deep networks learn on complex datasets is an extremely challenging task. However, as shown in this post a lot of insight can be gained quite easily by using simple 2D data, and we have barely scratched the surface here. For instance, we did not even touch the effects of noise, generalization, training procedures, and more. Hopefully, readers will find the provided code useful for exploring these issues, build intuitions about the numerous architectural changes that are proposed on arXiv every day, and to understand currently successful practices better. 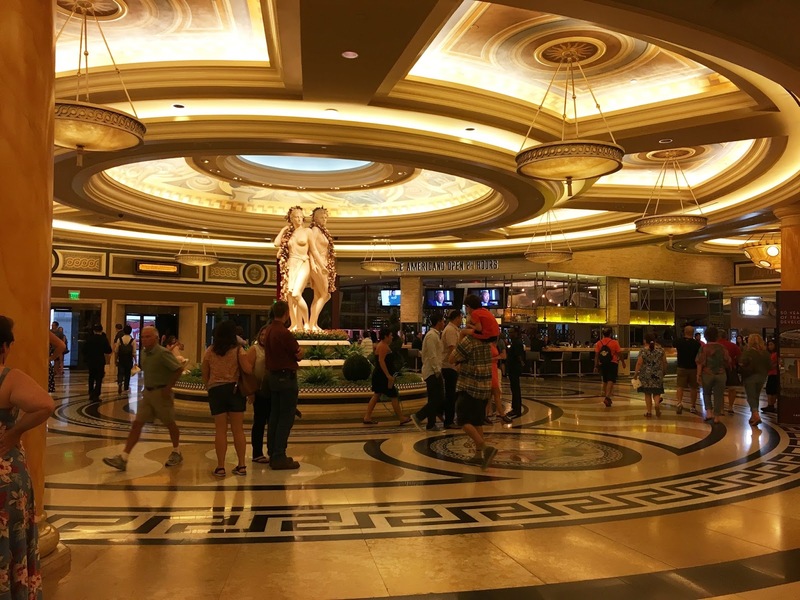 This year CVPR saw a staggering attendance of over 3600 participants. 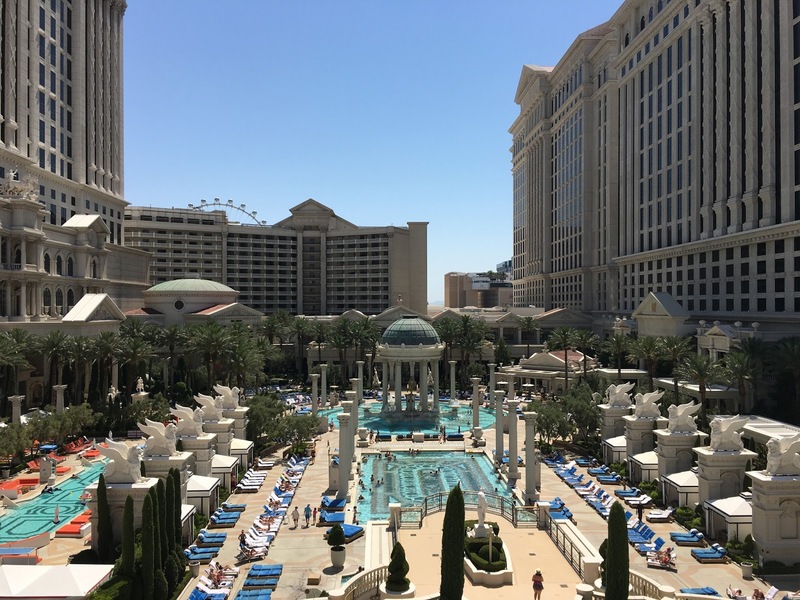 As I sat in one of those chandelier lit colossal ballrooms of Caesar Palace (checkout some cool photos from my Vegas trip above :smiley: ), I had only one aim in mind - to keep an eye for honest research which is of some interest to me. Needless to say publications featuring CNNs and RNNs were in abundance. 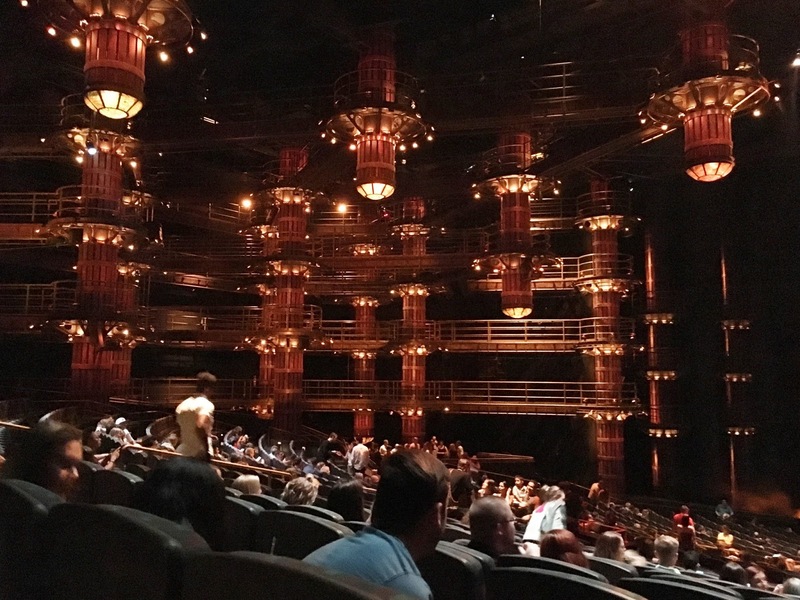 However it seems like the vision community as a whole has matured a little in dealing with these obscure learning machines and the earlier fascination with the tool itself has been replaced by growing interest in its creative and meaningful usage. In this post I will highlight some of the papers that seem to be interesting based on a quick glance. 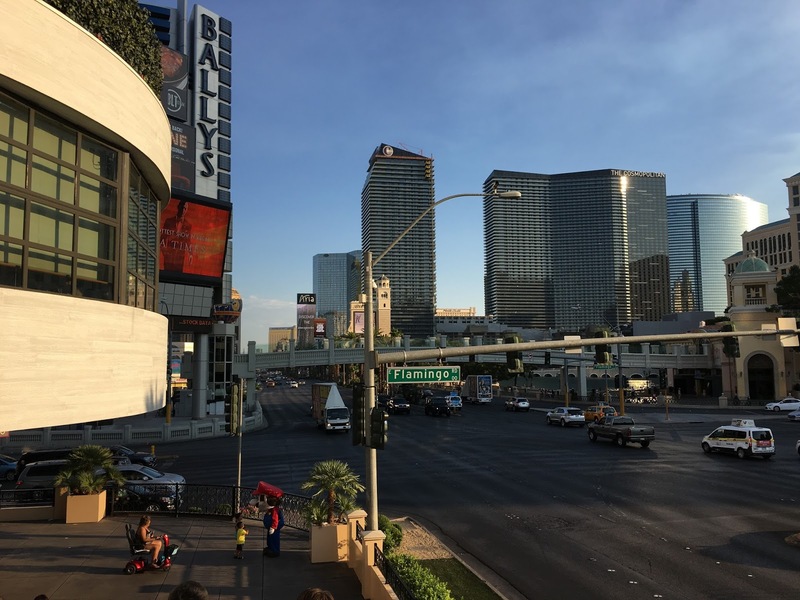 This blog post is very similar in spirit to the excellent posts by Tomasz Malisiewicz where he highlights a few papers from every conference he visits. I think it is a good exercise for anyone to keep up with the breadth and depth of a fast moving field like Computer Vision. 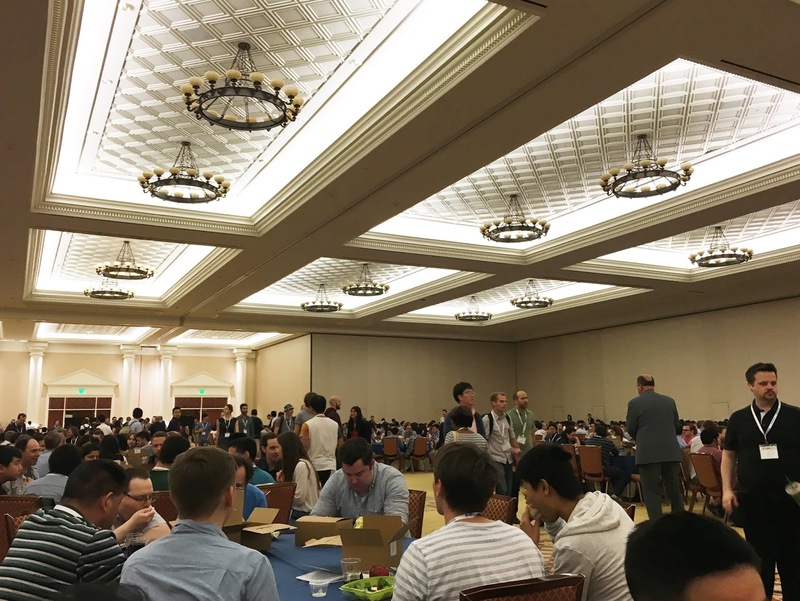 As always many a grad students (including me) and possibly other researchers are waiting for Tomasz’ highlight of CVPR 2016 (which based on his recent tweet is tentatively named ‘How deep is CVPR 2016?’). 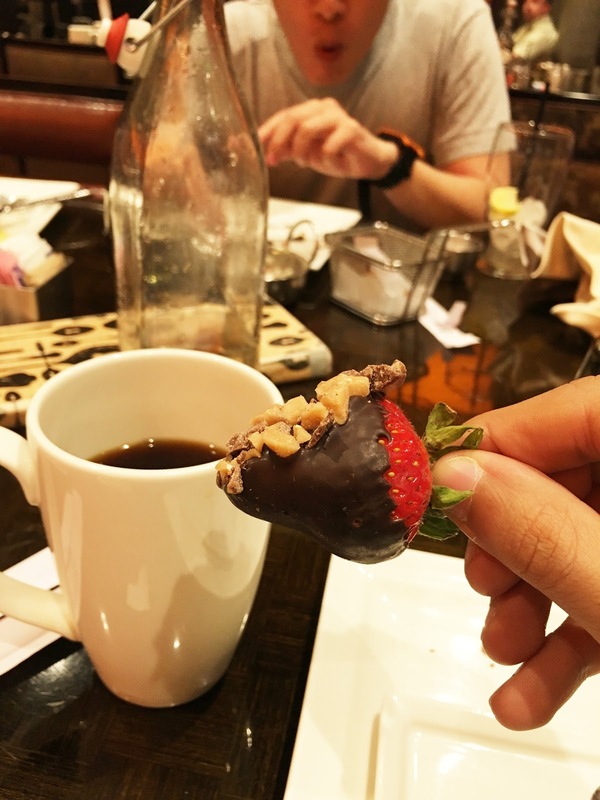 But while we are waiting for it let us dive in! Neural Module Network: This work proposes composing neural networks for VQA from smaller modules each of which performs a specific task. The architecture of the network comes from a parse of the question which specifies the sequence in the which operations need to be performed on the image to answer the question. A follow up work is also available here where instead of committing to a single network layout, multiple layouts are proposed and a ranking is learned using the REINFORCE rule in a policy gradient framework. 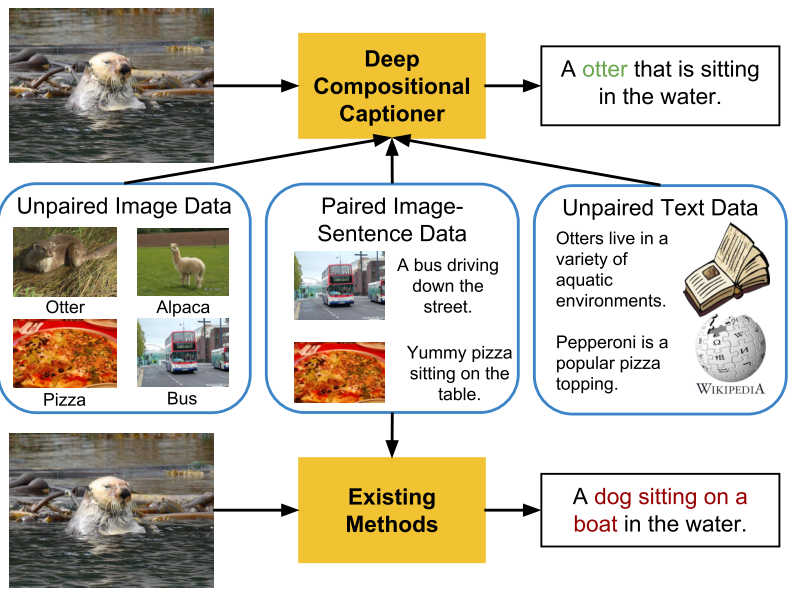 Deep Compositional Captioning: Describing Novel Object Categories without Paired Training Data: Most image captioning models required paired image-caption data to train and cannot generate captions describing novel object categories that aren’t mentioned in any of the captions in the paired data. The main contribution of the paper is to propose a method to transfer knowledge of novel object categories from object classification datasets. Multimodal Compact Bilinear Pooling for Visual Question Answering and Visual Grounding: Most deep learning approaches to tasks involving image and language require combining the features from two modalities. The paper proposes MCB as an alternative to simple concatenation/addition/elementwise multiplication of the image and language features. MCB is essentially an efficient way of performing an outer product between two vectors and so results in a straightforward feature space expansion. 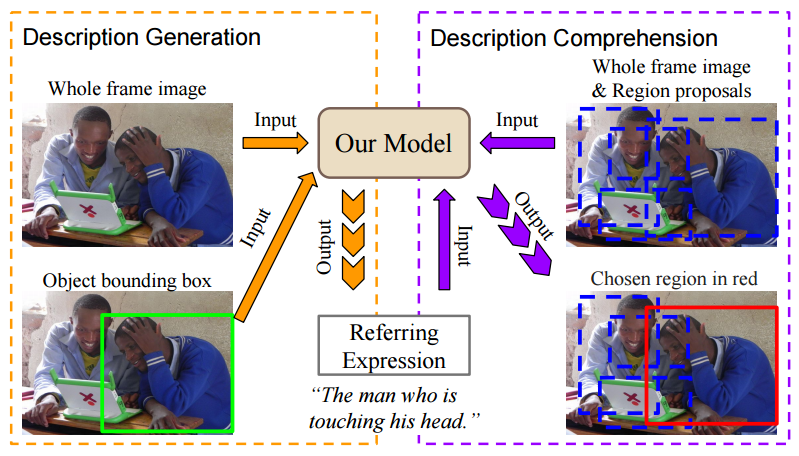 Generation and Comprehension of Unambiguous Object Descriptions: The main idea of the paper is to jointly model generation and interpretation of referring expressions. A smart thing about this is that unlike independent image caption generation which is hard to evaluate, this joint model can be evaluated using simple pixel distance to the object being referred to. 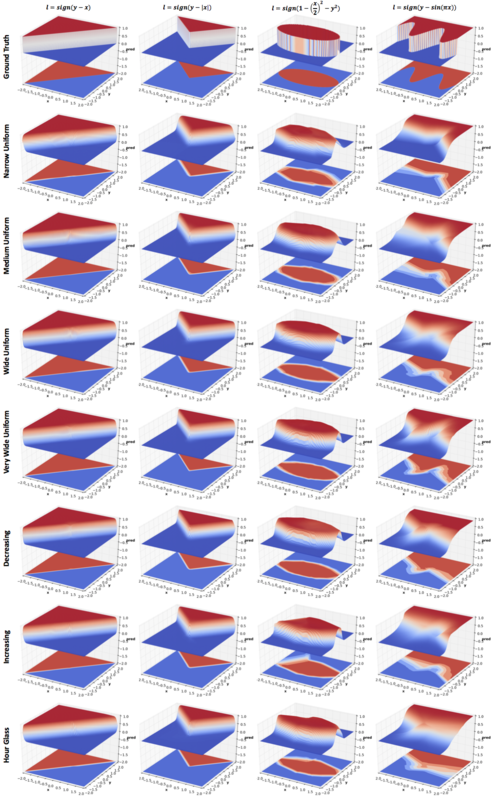 Learning Deep Representations of Fine-Grained Visual Descriptions: The task is to learn to classify novel categories of birds given exemplar captions that describe them and paired image caption data for other bird categories. 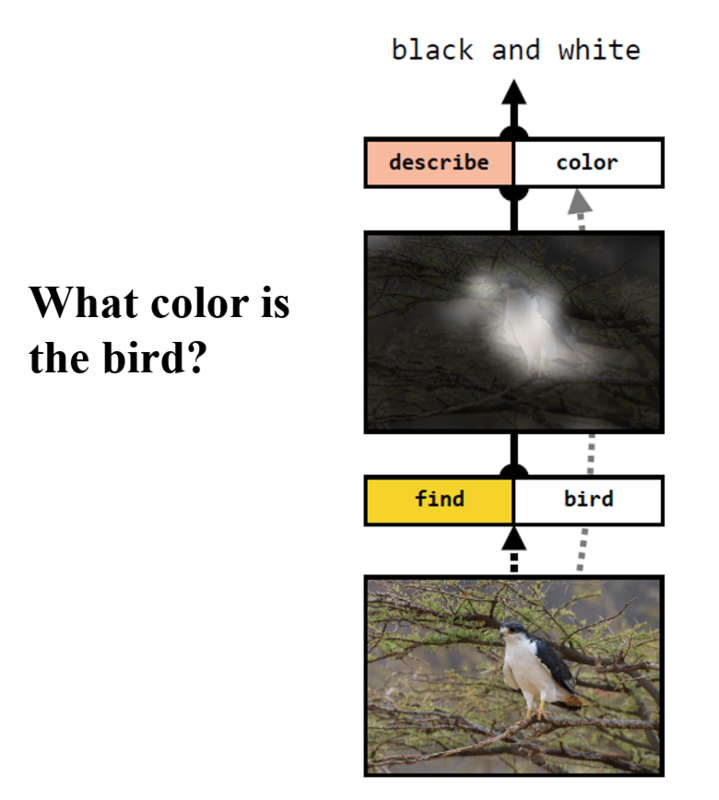 The proposed model learns to score captions and images and classifies any new bird image as belonging to the category of the nearest neighbor caption. 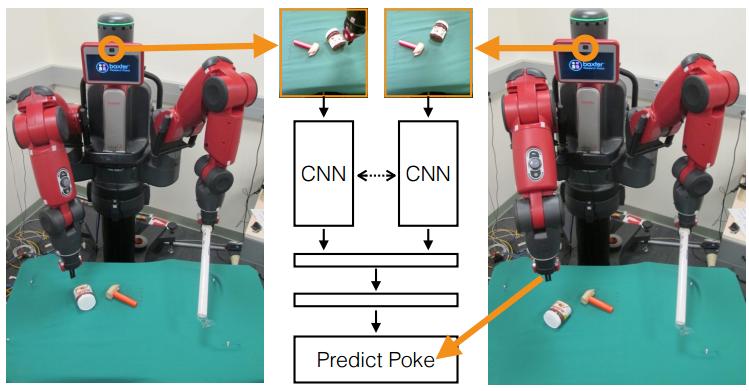 Learning to Poke by Poking: Experiential Learning of Intuitive Physics: The main idea here is to let a robot run amok in the world and learn to perform specific actions in the process. In this case the robot repeatedly pokes different objects and records the images before and after the interaction collecting 400hrs of training data. Next a network is trained to produce the action parameters given the initial and final image. In this way the robot learns certain rules of physics like the relation between force, mass, acceleration and other factors that affect the change like friction due to a particular surface texture. At test time, this allows the robot to predict an action that will produce a desired effect (in this case specified by initial and final images). Also refer to their previous work Learning to See by Moving where egomotion is used as supervision for feature learning. Some other invited speakers at VQA workshop were - Ali Farhadi, Mario Fritz, Margaret Mitchell, Alex Berg, Kevin Murphy and Yuandong Tian. Do checkout their websites for their latest works on Vision and Language. Training Region-Based Object Detectors with Online Hard Example Mining: This work is a reformulation of the classic hard negative mining framework that was once popular for training object detectors with far more negative/background samples than positive examples. The training involved beginning with an active and possibly balanced set of positives and negatives. 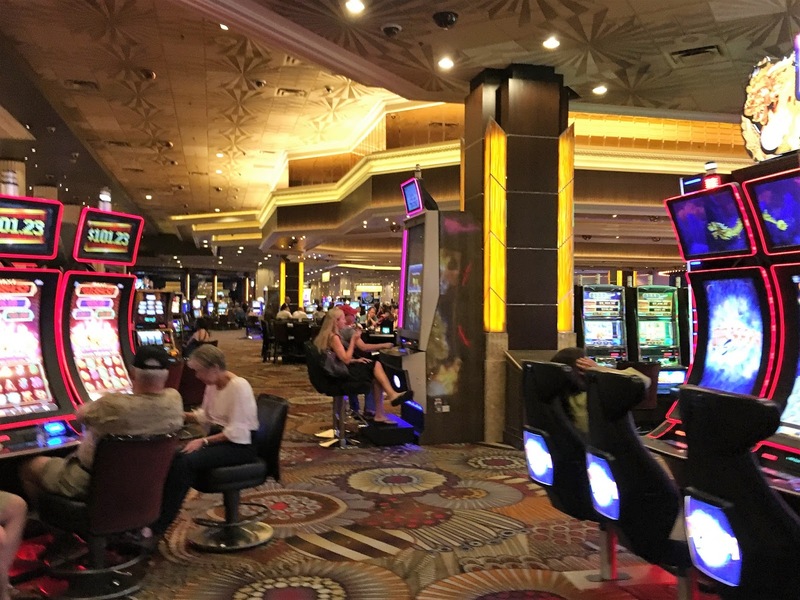 A classifier trained on this active set was applied to the complete training set to identify hard false positives which were then added to the active set and the process was repeated. 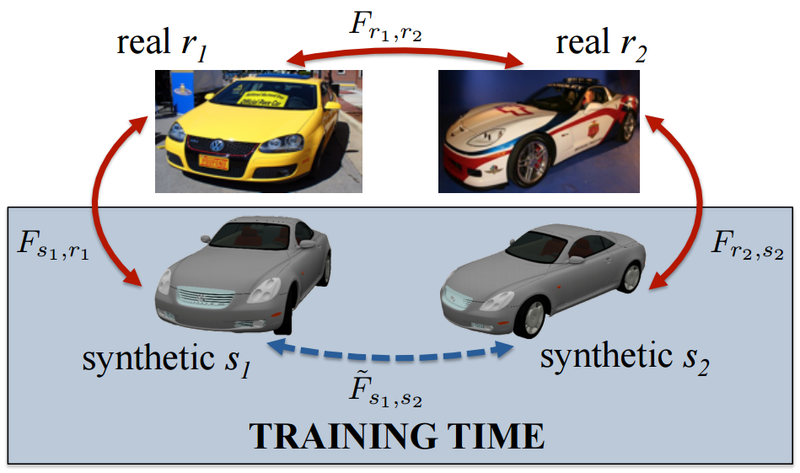 This paper presents an online version of this methodology which rhymes well with current object detectors like Fast-RCNN which are trained using SGD with mini-batches. You Only Look Once: Unified, Real-Time Object Detection: A little pony used its magical powers to create a really fast and simple object detector. 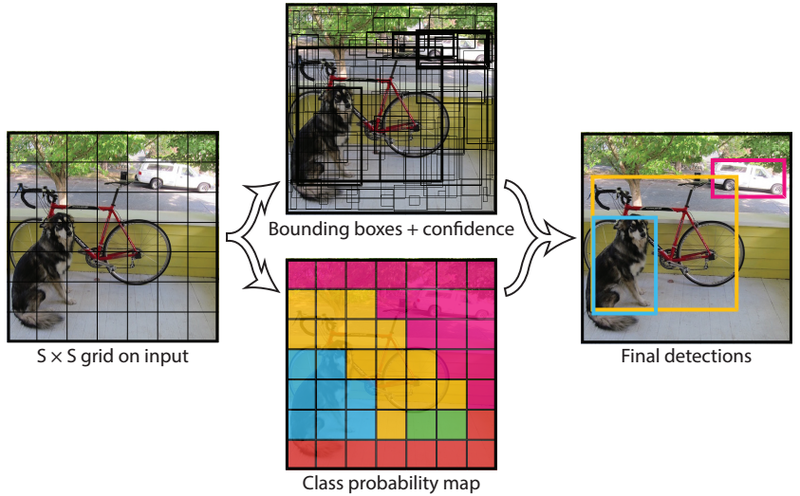 The key idea is to use a single forward pass through a convolutional network and produce a fixed number of bounding box proposals with corresponding confidence values, and class probabilities for every cell on a grid. The pony also took great risk but delivered a mind blowing live demo of YOLO Object Detector during its oral session at CVPR. 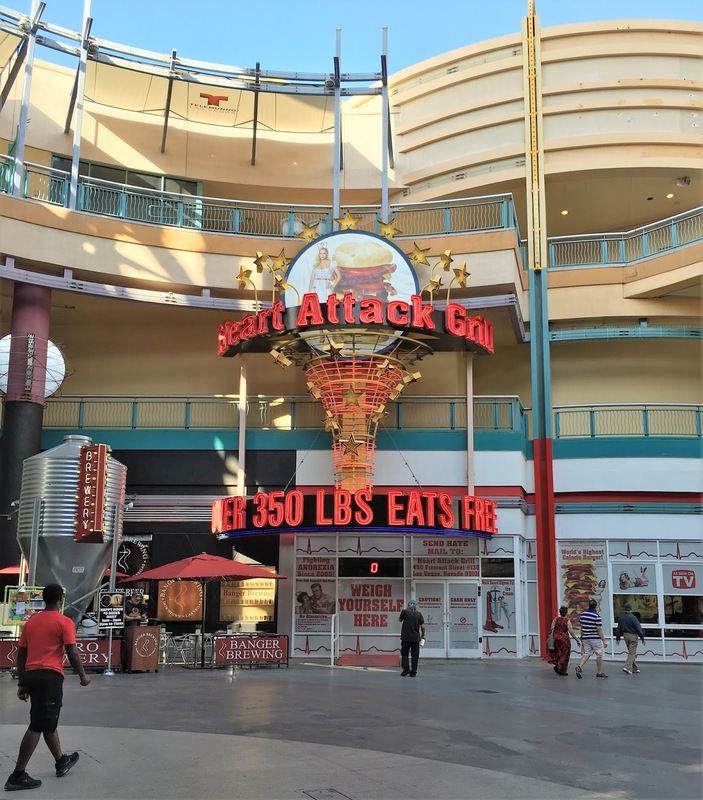 LocNet: Improving Localization Accuracy for Object Detection: This work proposes an approach to improve object localization. First the initial bounding box is enlarged. Then a network is used to predict for each row/column the probability of it belonging inside the bounding box (or alternatively the probability of that row/column being an edge of the final bounding box). Deep Sliding Shapes for Amodal 3D Object Detection in RGB-D Images: This paper from Jianxiong Xiao’s group in Princeton shows how to extend the Region Proposal Network (RPN) from Faster-RCNN to do 3D region proposal. This region proposal is amodal meaning that the proposed bounding box includes the entire object in 3D volume irrespective of truncation or occlusion. For recognition they combine deep learned 2D appearance features from image with 3D geometric features from depth extracted using 2D/3D ConvNets respectively. 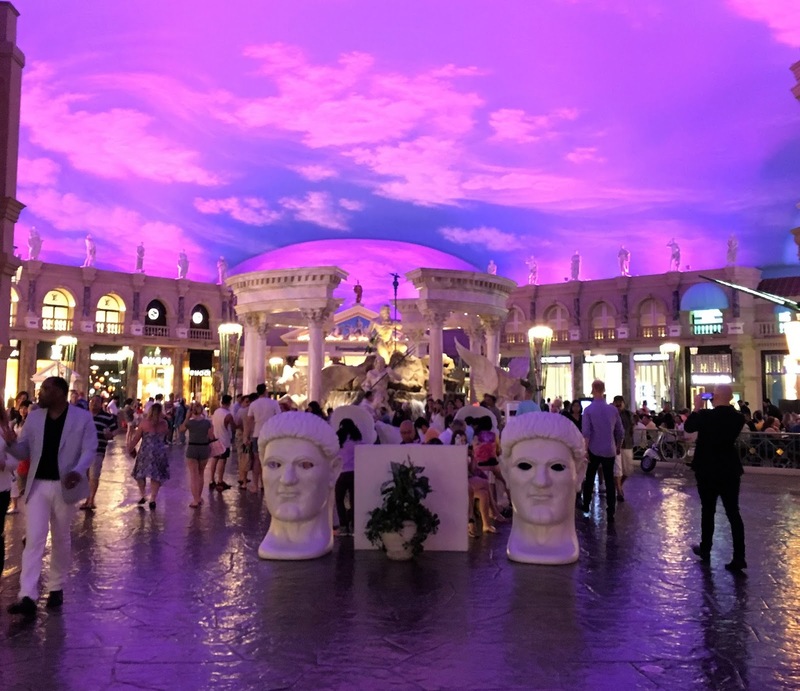 3D Semantic Parsing of Large-Scale Indoor Spaces: This paper due to a collaboration between Stanford, Cornell and University of Cambridge deals with parsing of large scale 3D scenes. For instance consider parsing an entire building into individual rooms and hallways, and then further identifying different components of each room such as walls, floor, ceiling, doors, furnitures etc. The paper also suggests novel applications that can result from this kind of parsing - generating building statistics, analysing workspace efficiency, and manipulation of space such as removing a wall partition between two adjacent rooms. GOGMA: Globally-Optimal Gaussian Mixture Alignment: Gaussian mixture alignment can be used for aligning point clouds where both the source and target point clouds are first parameterized by a GMM. The alignment is then posed as minimizing a discrepancy measure between the 2 GMMs. This paper presents a globally optimal solution when the discrepancy measure used is L2 distance between the densities. Learning Dense Correspondence via 3D-guided Cycle Consistency: The idea in this paper is to match both source and target real images with images rendered from a synthetic mesh. This establishes a consistency cycle where the correspondence between the matched synthetic images is known from the rendering engine by construction. 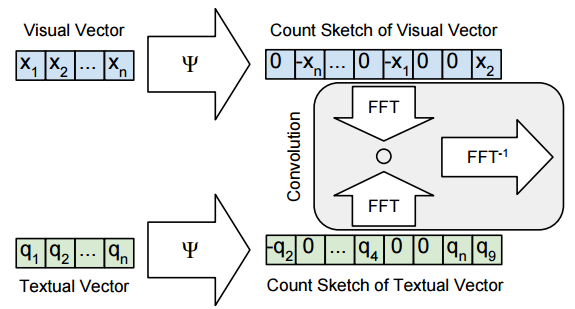 This is used as a supervisory signal for training a ConvNet that produces a flow field given source and target images. 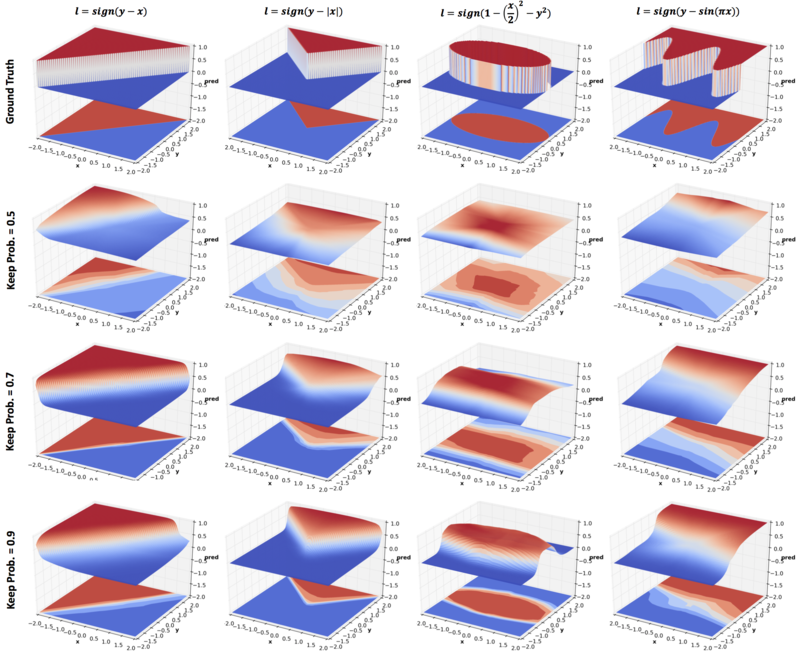 Unsupervised Learning of Edges: The key insight is that motion discontinuities always correspond to edges even though the relation does not hold in the other direction. Their algorithm alternates between computing optical flow and using it to train their edge detector. The output of the improved detector is then further used to improve the optical flow and the process continues. Over time both optical flow and edge detection benefit from each other. Context Encoders: Feature Learning by Inpainting: Given an image with a region cropped out from it, the encoder produces a feature representation. These features are passed on to a decoder that produces the missing region. One of their results is that pretraining a recognition network in this fashion achieves better performance than random initialization of weights. The next couple papers are about weakly supervised learning where annotation is available though not in the most direct form. 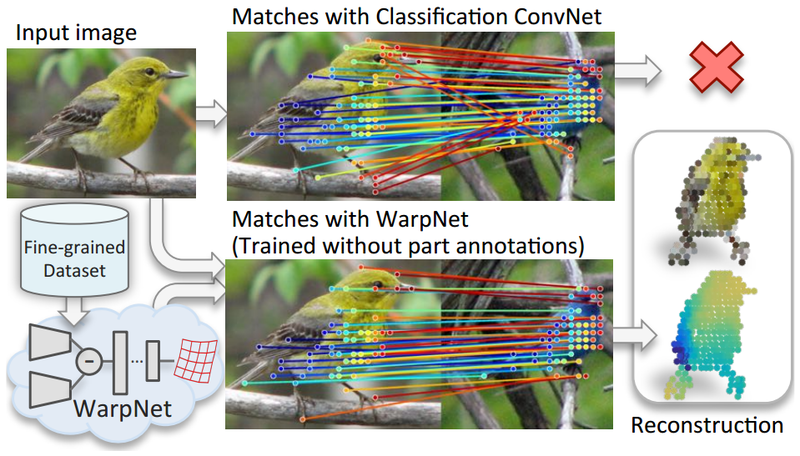 WarpNet: Weakly Supervised Matching for Single-view Reconstruction: Consider the problem of reconstructing a bird from a single image. One way to do this is to use a fine grained birds dataset and use key-point matches across instances to do non-rigid structure from motion. However traditional key-point detectors like SIFT would fail to give good correspondence due to appearance variations. This paper proposes WarpNet, a network that produces a Thin Plate Splines warping that is used as a shape prior for achieving robust matches. Furthermore the network is trained in an unsupervised manner without any part annotations. Multi-scale Patch Aggregation for Simultaneous Detection and Segmentation: The proposed approach is to densely sample predefined regions in the image and for each region produce a segmentation mask (basically foreground/background segmentation) and a classification. The segmentation masks are then fused together to get instance level segmentation. 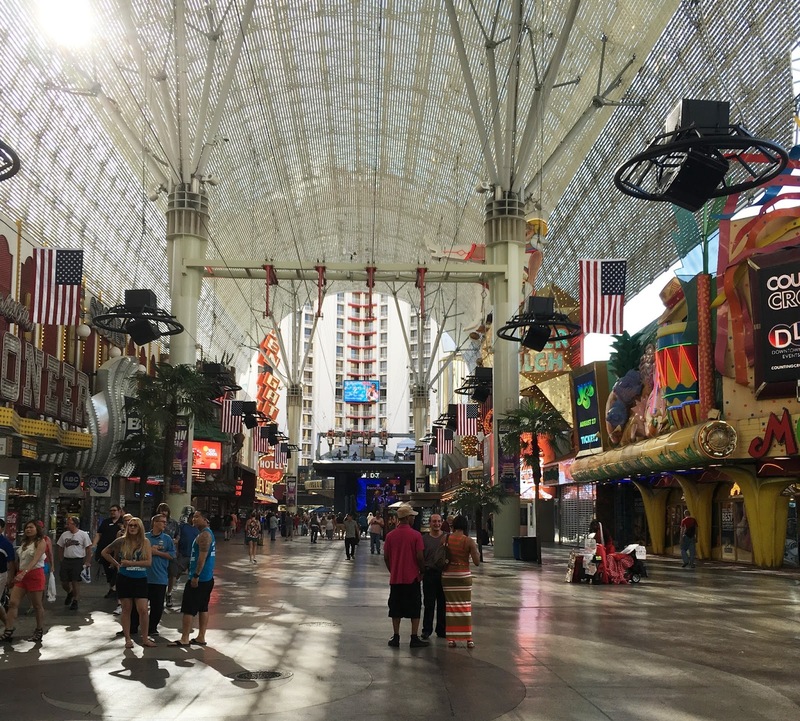 Feature Space Optimization for Semantic Video Segmentation: For semantic segmentation in still images the fully connected CRFs could operate in a very simple feature space - RGB color channels and pixel coordinates. An obvious extension to video using time as an extra feature does not work since moving objects take apart pixels belonging to the same object in consecutive frames. 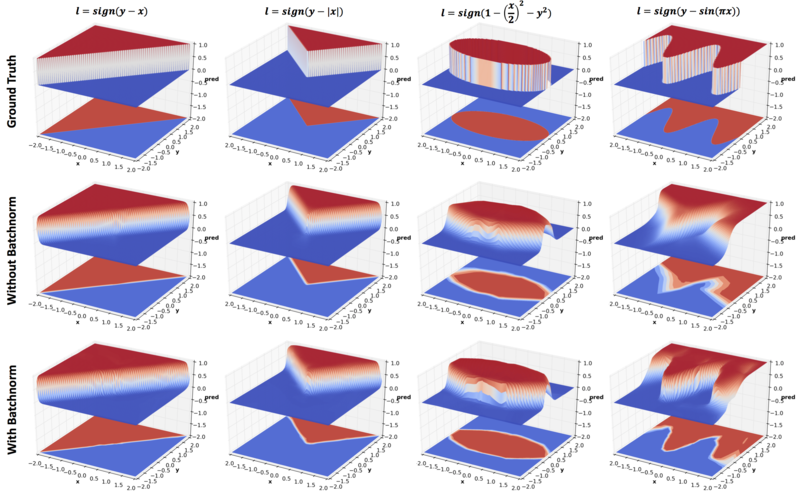 The proposed approach learns an optimal feature space over which fully connected CRFs with gaussian edge potentials can be applied as before. 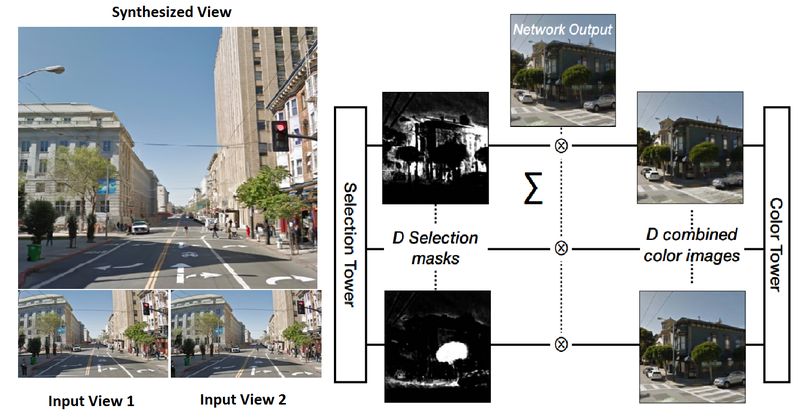 Semantic Image Segmentation with Task-Specific Edge Detection Using CNNs and a Discriminatively Trained Domain Transform: In this work, features produced by a ConvNet are used to produce both a semantic segmentation mask as well as an edge map. The produced edge map is then used to perform domain transform on the segmentation mask for edge preserving filtering. The entire system is trained end-to-end. DenseCap: Fully Convolutional Localization Networks for Dense Captioning: An image is fed into a network that produces convolutional feature maps. A novel localization layer then takes this feature maps and produces region proposals. Bilinear interpolation is used to get region features from the full size feature maps which are fed into another network with RNN at the end that generates a description for that region. 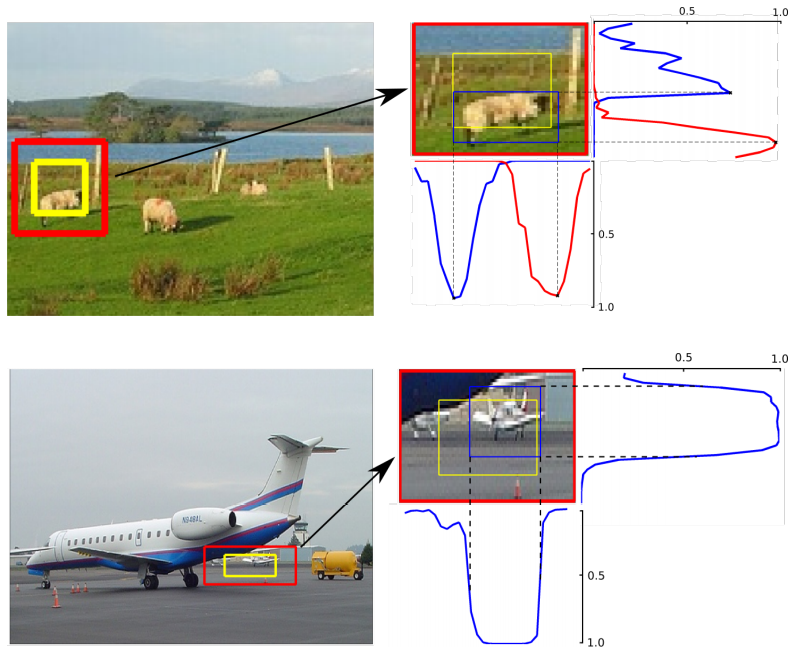 Deep Stereo: Learning to predict new views from world’s imagery: The task is that of novel view synthesis from a given pair of images from different views. A plane sweep volume is feed into a network with a carefully designed architecture that consists of a Color Tower which learns to warp pixels and a Selection Tower which learns to select pixels from the warped image produced by the _Color Tower. Current stereo depth estimation algorithms work very well for images of static scenes with sufficient baseline. However, depth estimation in low baseline conditions where the foreground and background move relative to each other is still a hard problem. 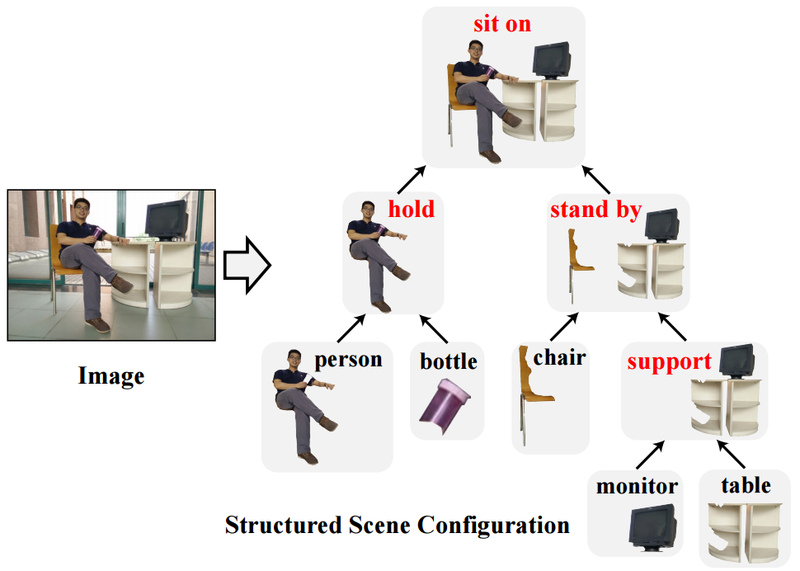 The next paper from Vladlen Koltun’s group talks about dense depth estimation of scenes with moving objects from consecutive frames captured using a monocular camera. 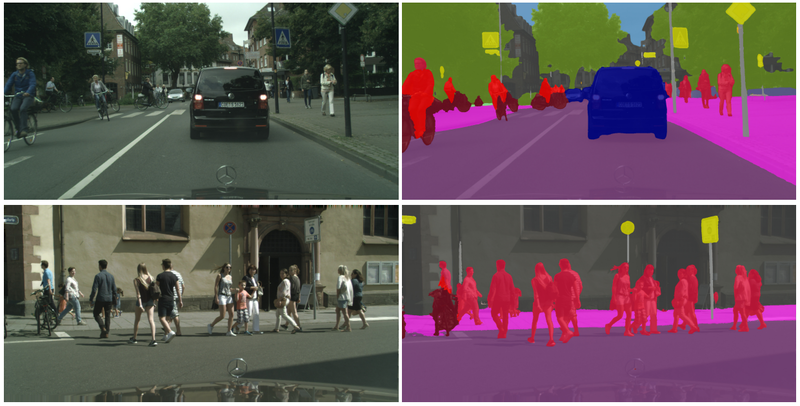 Dense Monocular Depth Estimation in Complex Dynamic Scenes: Due to moving objects present in the scene, the optical flow field is first segmented. Depth is estimated using separate epipolar geometry of each segment while enforcing the condition that each segment is connected to the scene.